Tradition and elegance integrated into a complete ceramic system to satisfy all and any design requirement. The Bisello collection has been designed for the tiling of public and private spaces. Used by those who wish to decorate with a touch of retro style, they create bright and dynamic environments with a superbly suggestive play of light and shadows. The BISELLO collection, available with a satin finish derived from the Vogue System TRASPARENZE collection, is available in 18 colours with finishes and sizes that can be mixed and matched with the TRASPARENZE line. 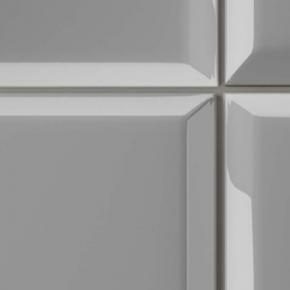 To complete the offer, the QUADRA listello tile is available, a perimeter closing element, and special piece code N, available in the same colours as an alternative to the jolly finishing for edges.